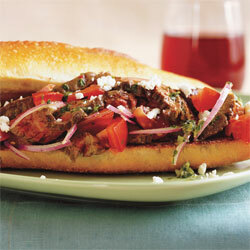 These cheesesteaks, from a recent edition of Everyday with Rachael Ray are simply outstanding. I made them using some leftover grilled flank steak. So simple and so darn good. I used whole grain rolls for the healthiness factor and made all the vegetables and sauce even though I only made two sandwiches. The recipe can be found here. It was part of the Weekly Menu Planner part of the magazine, which gives meals for each day and one big shopping list for them all. Pretty creative idea. So far, I have been really impressed with the magazine and the way the recipes from it have turned out. Some of the recipes are not 30 minute meals, but they are in a different section than the ones that are supposed to take 30 minutes. I already signed up for a two-year subscription and, based upon the first few issues, I expect the magazine will only get better with time.